Salman Khan is a man of many talents. As much as he can make his fans laugh and cry at the same time onscreen, his Midas touch cannot be missed when it is about holding that paint brush too. The Sultan actor is a fine performer and he has been quite humble about it. So much so, that he recently called himself​ a ‘limited actor’ at the trailer launch of Tubelight. However, Salman has hardly ever spoken about his another skill — that he can paint. A closer look and you’ll realise that his paintings do a better talking about his thoughts whenever he has made a piece of art. Salman Khan has always revered painting, and has been caught indulging into it in his alone time. Lately, the Dabbang actor has been sketching a few portraits of Jesus Christ. 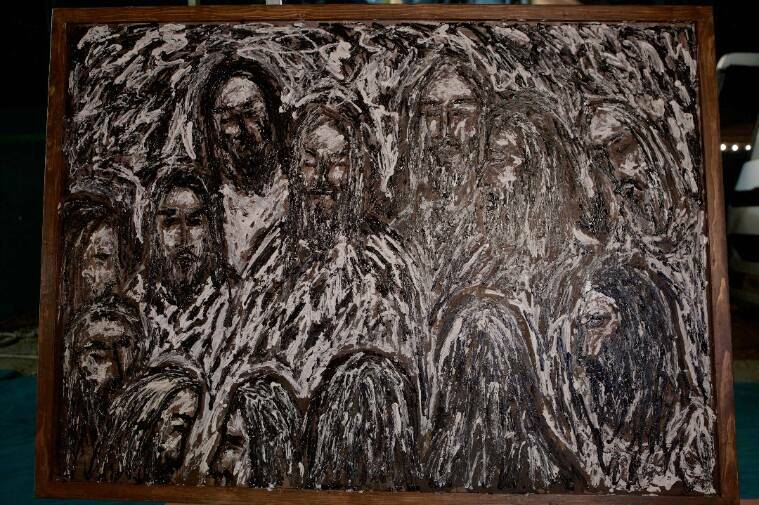 This time around, the actor made a beautiful painting of Christ while on the sets of Tubelight. And the entire crew was in awe of his excellent work. Many of them were even surprised when they came to know about his hidden talent. Check out the painting Salman Khan made on the sets of Tubelight. salman khan paitning, salman khan paints, salman paintings pics, salman khan painting tubelight, salman khan tubelight painting The painting which actor Salman Khan made on the sets of Kabir Khan directorial Tubelight. Salman, being the multi talented actor, got closer to his painter side during his difficult times spent in jail. His paintings are unique, some are abstract, and some have modern strokes. He loves mixing colours on his palette. The Tiger Zinda Hai actor mostly paints religious themes like Buddha, Shiva, or Christ and more, backed by his interpretation of oneness of God. Salman keeps most of his paintings locked up in his Panvel farmhouse, and sometimes he also gifts them to his friends in the industry. Some of his paintings are also auctioned and the funds go directly to his NGO — Being Human. His upcoming film Tubelight is produced by him and his mother Salma Khan, and directed by Kabir Khan. It stars Salman Khan, Sohail Khan and Zhu Zhu, and will have a worldwide release on Eid. Ajay devgn posted Photo with modi!! Now let's see If It makes any Change in collection? Take a deep breath nd calm down..done? Now suggest me some good android games.